After artistic performance in front of the Museum of Contemporary Art in Belgrade in the frame of The Salon of the Unbribables, Vladan Jeremić, a member of ArtLeaks, was arrested. These days, the Salon of the Unbribables organizes a series of events that aim to break with the habit of public silence about the state of culture and art. The visitors were invited to put on a paper mask resembling the portrait of Serbia’s president and to share flyers with sandwiches printed on them to the museum guests. The action reflects the current situation in Serbia, where, although almost everybody is unsatisfied with financing, party pressures, amateurism of the leading cadres and (self-)censorship, only a few speak about this is public. Media control and political surveillance have led to a situation, where most of cultural workers, out of personal interests and fear to lose their job or financial support, are silent about the economic and mental repression they are exposed to. Half an hour later, another artist, Uroš Jovanović, was arrested in front of the museum, after he tried to enter the Museum with a big framed photograph of the Serbian president with the statement: Vučić—the best artist. Vladan Jeremić and Uroš Jovanović were released from police station after several hours of interrogation. Dear Hito, thank you for opening this conversation. Art performances in front of the Museum of Contemporary Art in Belgrade on October 20, 2017 led to the arrest of two artists. Vladan Jeremić, who is member of ArtLeaks and one of the organizers of the cultural event Salon of the Unbribables and Uroš Jovanović, an independent artist and performer, were arrested and brought to police station for interrogation. The police officers suspected them for “insulting the president,” which the artists said was not their intention. The state prosecutor decided to let them go after several hours of interrogation. The performance, part of the program of the Salon of the Unbribables, was staged in front of the museum. 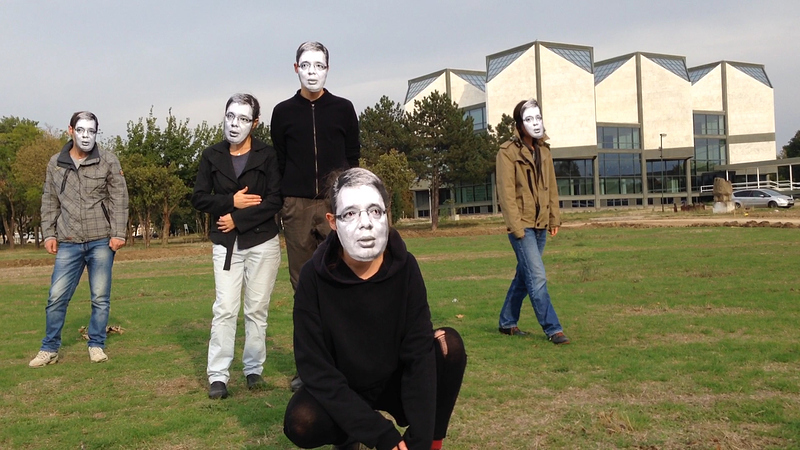 Visitors and guests coming to the opening of the museum were invited to wear a paper mask with an image in close resemblance of Serbia’s president Aleksandar Vučić, while handing out leaflets with only an image of a sandwich printed on it. The artistic action was positively received by most of the public that understood it as a visual metaphor of the structural situation most citizens of Serbia are living in. The Government of Aleksandar Vučić, prime minister of Serbia since 2014 and elected president since April this year, has grounded its power on a system of nepotism, intimidation, “buying” of supporters through giving jobs and privileges to party members, mudslinging against political opponents and control over the media. At the same time, his rule is supported by many right-wing leaders of EU, US, and Russia as factor of stability in the Balkans. A system that can be named “partocracy” has led to an atmosphere where raising a critical voice can turn your colleagues against you and finally endanger your job. Under these circumstances, it is not surprising that private security staff controlling visitors at the entrance to the museum immediately reacted, when they detected the image of the president and flyers with sandwiches in some of their bags. Visitors, one of them being a visiting curator from Denmark, were treated very rudely and given over to the police for identity check. Vladan Jeremić, who came to the scene to explain that he was one of the organizers of the artistic performance using these props, was arrested immediately. Although curators of the Museum of Contemporary Art, who witnessed the arrest, tried to intervene and explained that he is a well known artist from Belgrade, Vladan Jeremić was brought to the police station for interrogation. That in Serbia it’s not a good idea to create the slightest impression of having a critical stance towards the leader of the country, Uroš Jovanović, an independent artist and performer, experienced half an hour later. 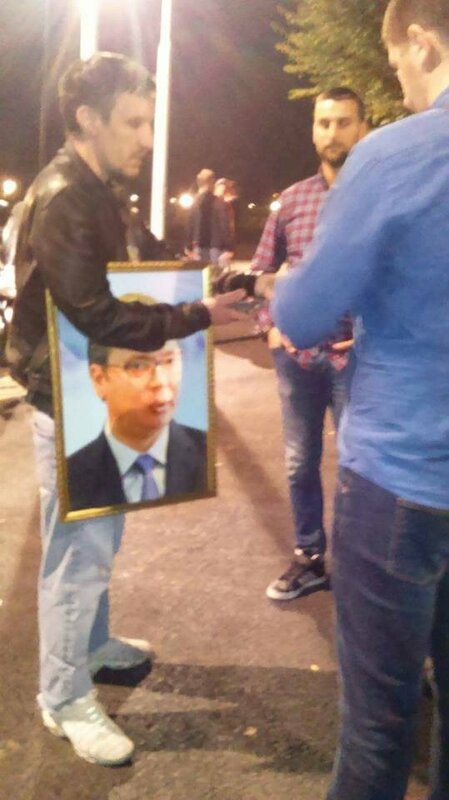 He was arrested when he tried to enter the museum with a giant golden framed photograph of the Serbian president with the statement: “Vučić – the best artist.” A few months ago, the image of the president indeed was an issue of discussion, when Minister of defense Vulin and Minister of education Šarčević proposed to put up his picture in public institutions and schools. The proposal was welcomed by Serbian Prime Minister Brnabić because, as she said, the cult of national symbols of Serbia should be strengthened. The Belgrade Museum of Contemporary Art hosts a valuable collection of twentieth-century art from the region. Due to organizational difficulties during the process of reconstruction of the building, it was closed for more than 10 years, a scandalous fact, which for the authorities still owe a comprehensive explanation to the public. With the re-opening of the museum, this cultural institution has the potential to become one of the platforms for the promotion of the progressive image of Serbia in Europe and the world. But the arrest of two artists in the context of it’s opening, even if only for interrogation, casts a shadow on the blank surface of the country’s political system that on paper protects civil rights, minorities, and freedom of speech. Silencing critique about the actual effects of their social, economic, and cultural policies through the declarative integration of liberal values is a mainstream tactical move of the New Right that establishes it’s strongholds across Europe and the US. In Serbia, the integration of rightwing political goals with liberal values becomes evident for example in the cultural strategy for the country recently proposed by the Ministry of Culture. This policy document includes a list of criteria that define what is Serbian culture, in Serbia and beyond. In almost every detail of the program, the integration of liberal values (cultural tolerance, democracy,…) legitimizes the pushing through of a highly problematic understanding of Serbian national culture. The preliminary document contains a catalogue of precise criteria rooted in folklore, national myths, and national hardship, that have historically formed Serbian national identity, which needs to be defended from globalization. With such program, the cultural strategy fosters backwardness and re-traditionalization of the population, while the economic politics of the government support the opening of the market to most primitive global investors looking for cheap manual labor and low taxes. With this artistic initiative, the Unbribables are aiming to break the public silence about the mental, psychological, and economic repression many citizens of Serbia are exposed to in their professional work, especially in the field of culture, media, and education. Just wanted to express solidarity and sincere empathy, based on shared experience, of polish art workers. There have been recent examples of censorship, withdrawal of funding, and even persecution of people involved in critical artistic activities. As you are well aware, the authoritarian wave currently engulfs Poland, following crack downs in Hungary, Russia, Turkey, etc. Obviously, the very artistic freedom is at risk. I wish to join in expressions of solidarity and empathy from neighboring Croatia, where situation is not much different. Working conditions in culture are completely precarious, and the State thinks of art only as propaganda. This condition is global, yet we need to struggle in many individual fronts. I wish all the best of luck to my Serbian colleagues and friends! The Association Independent Cultural Scene of Serbia (NKSS) strongly condemned the arrest of artists Vladan Jeremic and Uros Jovanovic, as well as the prevention of realisation of artistic performances during the evening of the official opening of the Museum of Contemporary Art in Belgrade (MSUB), judging it as a typical case of censorship. “Given the fact that these were announced artistic actions that were non-violent, nor did they endanger anyone, it is obvious that this is a typical case of censorship, and this in front of an institution that should be the pillar of freedom of expression and respect for contemporary art which implies a critical attitude towards different social appearances and phenomena“, the NKSS Board of Directors announced on October 24. According to NKSS, it is unacceptable that “members of the private security and the police prevent the realisation of an announced performance and arrest artists”. “If private security and the police want to express their critical judgment or take on the role of the curator, they should announce it and be prepared to explain how they include the arrest of an artist in their curatorial practice”, the NKSS said. The NKSS also estimates that the absence of a public reaction by the organizer of the seven-day opening program of the MSUB suggests that such operations of the security and police are acceptable and desirable. Pointing to the constitutional ban on censorship in Serbia, the NKSS Association raised the question of the responsibility of those who took on the freedom to reverse the interpretation both of the Constitution and international conventions on freedom of expression ratified by the state. At the same time, the NKSS called on the professional and wider public to sharply condemn the restriction of freedom of expression and to support the artists. This artistic intervention is an act of epistemic disobedience. It points to the steep gap between the rigid agency of the political apparatus that cracks the epistemology of contemporary art in the Serbian political context. There is a few new developments about the happenings around the arrests of artists and harassment and violations to visitors of the Museum of Contemporary Art Belgrade (MSUB). Contradictory statements of museum officials during a press conference, on friday October 27, shed a new light on the role of the museum and the use of private security companies for these events. 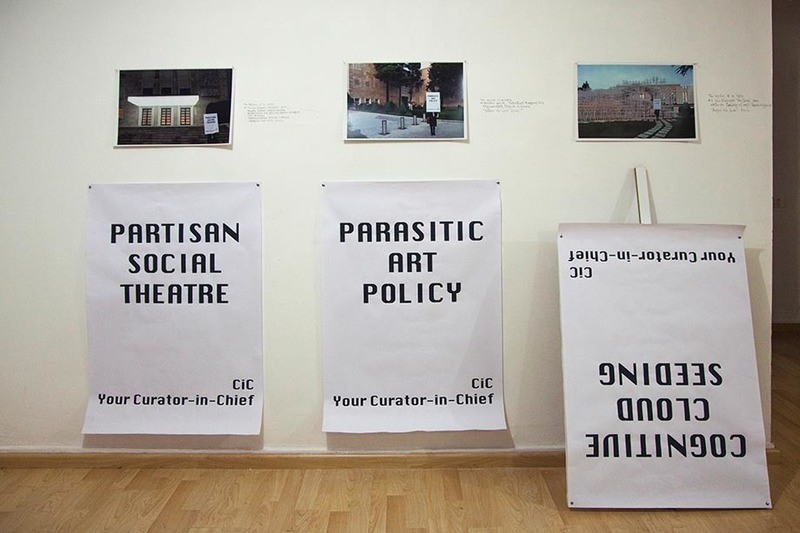 It is positive that the curators of the museum emphasized that artistic performances are at stake and that the temporary arrest of artists represents an attack on the freedom of artistic expression, according of what Dejan Sretenovic said. It is however alarming that MSUB’s acting director Nakarada didn’t confirm this view, estimating that the performance to carry an image of the president into the museum could harm both property and the visitors of the museum, and that such kind of art exceeds certain limits of civilized norms. It is interesting that even after the prosecutor didn’t find any evidence of infringement of law concerning the performances using the image of the president, the museum director didn’t condemn the proceeding of the police and denied any responsibility for the arrest of Vladan Jeremic ‘outside of the territory of the museum’. There is an important detail, the museum officials should know. It was the private security at the museum entrance that found a mask and flyers with sandwiches - props of the performance - in the bags of a visitor and hereupon handed her over to police for an identity check. Vladan Jeremic took responsibility for the performance, when he noted visitors being violated and harassed because of performance props and was then arrested. There was no comment on the fact that private security searched visitors explicitly for paper sheets, cardboard, sketchbooks, drawings and flyers during the week-long opening nor on the identity-check of several visitors that had been making pictures during the performance of Uros Jovanovic. It is obvious that the aim of the controls was not to protect ‘public and /or property’. 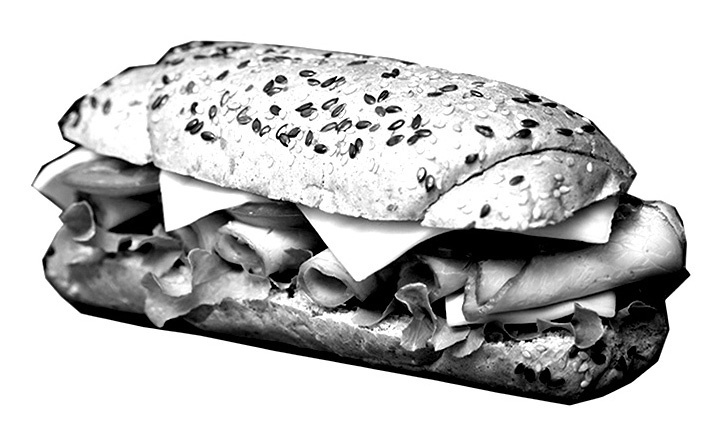 How could a paper mask with the president’s image or a printed sandwich do any harm? According to testimonies of several visitors it was not only the ‘image’ of the president that seemed to pose a threat to certain norms. Three young artists, Jelena Jaćimović, Sofija Modošanov and Tanja Todorović who stayed for 7 days, 24 hours in the museum, stated in a radio interview last friday (https://www.mixcloud.com/Sceniranje/sceniranje-34/, 1:02:33) that: „blank sheets of paper seemed to be the biggest threat for the museum“. People who wanted to visit them were controlled for drawings and paper in their bags and a restriction of the number of visiting friends and colleagues was introduced without their knowledge. Private security told them that ‘political connotations’ were not allowed to be brought into the museum space. Also a curator from Denmark, Parl Kristian Bjørn Vester, reported that security took out a doodle from a book he carried with him and threw it in the trashcan. This gives rise to several questions. How did the private security company knew when the group of artists expected friends? What general criteria was used and under which authority for controlling visitors and handing them over to the police for identity-check and who briefed the security about these criteria and gave them that authority? It appears that private security was the main means for implementing censorship and selection of desirable and undesirable public. It seems that security and control itself, became the chief curator of the most important institution of contemporary art in Serbia. This shows how strong the pressure is to whom the museum officials are exposed to. Still, it doesn’t change the fact that the organizers of the opening demonstrated its compliance with such acts of censorship. Therefore we call on the museum curators to take a stand for the freedom of artistic expression and to reclaim together with the public the necessary space contemporary art and culture deserves in our society. Instead of ritually advocating the freedom of speech or condemning the arrests of members of a group of artists and cultural activists The Unbribables during the opening ceremony in the Museum of Contemporary Art in Belgrade, may I propose the assertion that all forms of confronting the ever increasing power of State violence and organized crime structures in Serbia which complement it, are highly welcomed, given the widespread fear, apathy and a large-scale systemic corruption, which ex-Yugoslav societies succumbed to due to decades-long process of dismantling the remains of the system of social self-management in socialist Yugoslavia. Certainly, cultural institutions are not an exception in this respect, quite contrary. Even though an artistic performance of The Unbribables may be considered as a mere symbolic act having no directly endangering effects vis-à-vis the real economic and political interest of the ruling class in Serbia whatsoever – it nevertheless has been quite successful, in that it touched upon the issue of hidden mechanisms of the private capital appropriation of the social relations of production in the sphere of culture and arts; it was equally successful in terms of exposing hidden nexus of compliance between cultural institutions and official and unofficial structures of State power in Serbia. The significance of the symbolic action of two detained artists does not lie in the supposed act of reclaiming the allegedly autonomous sphere of cultural and art institutions amid a deeply corrupted system, for several reasons. Firstly, these institutions simply should not be defended in this respect because they cannot be abolished regarding the extent to which they already have been partaking in reproducing the systemic corruption, to which the case of the recent opening of the Museum of Contemporary Art Belgrade (MCAB), fully attests. Secondly, the cultural institutions are not an exception to the compliance with the all-pervasive system of corruption because herein we are not talking about the so-called modern, autonomous cultural sphere that has always defined itself, albeit nominally and formally, in opposition to or beyond the existing political order. As a matter of the fact, we are talking about a decades-long trend of the cultural and art institutions’ partake in the politics of culturalization of social antagonisms, i.e., the varying modes of ideological appropriation of what was historically and materially established as a socially owned means of production. Besides, the presupposed autonomous position of cultural and art institutions within the wider socio-political system could not be defended given the fact that there are no free and lasting autonomous zones in today’s capitalism that are either internal or external to the all-prevailing system of the reproduction of the relations of economic exploitation and political oppression. Besides that, there is no any existing form of social relationships that is entirely free of susceptibility to commodification, corruption and bribery, let alone the cultural sphere and art nowadays. What is more, over the last couple of decades the very cultural sphere has been one of the most important instruments to instigate the ideological mystification and glossy spectacularization of the historical sequence by accumulation of capital on a global scale, unprecedented in the history of capitalism. Under the brand name of the so-called contemporary arts, the institutional system of culture and arts has been partaking in the processes of capitalist accumulation, reproduction and centralization. Being supported by corporate capital in the disguised form of various foundations and banks, the employees of the industry of social, cultural or art activism and the so-called cultural workers have been keen to maintain their socio-economic position, blissfully oblivious by their constitutive partake in maintaining the ideological mechanisms to reproduce the existing systemic conditions. The MCAB is by no means an exception in this regard; as a constitutive part of the cultural and art institutional system in Serbia and ex-Yugoslav region, its basic social function has always been that of maintaining the reproduction of existing conditions of production of surplus value within the plurality of ideological state apparatuses, in spite of its nominally progressive social role. This really is nothing new under the sun. The novelty, however, is that this time though, and it is for the first time in MCAB’s history after the current State apparatus in Serbia has privately appropriated that what historically and materially had been established as social property – MCAB is acting now merely on behalf of repressive State apparatus and not solely as ideological state apparatus. With the exception of MCAB’s curator Mr. Dejan Sretenović who explicitly condemned the arrest of artists, the official statement by the director of MCAB Mr. Nakarada considering the detainment of two artists blatantly attests to the validity of this claim. Moreover, the MCAB statement was highly successful in revealing the way in which the institution and its clerics concerned herein have been complacent with the system of corruption, thereby succumbing to being taken over by official and unofficial structures of Serbian state apparatus. They somehow felt themselves as though their newly established role of being a part of a repressive state apparatus have been jeopardized, even if it was just the result of a plain symbolic act. The reaction of the MCAB officials in the repressive state apparatus fashion to the symbolic action of The Unbribables should be taken as a cautionary reminder that the ruling class won’t voluntarily give up the stolen social property without being compelled to do so. And this is something we should take into consideration from now on, namely the fact that the cultural and art institutions finally have been taken over by the ruling class as private property and are now acting on behalf of a repressive State apparatus, without any hesitation. Consequently, more coercion, pressure and violence coming from the state apparatus is something we should be increasingly expecting to happen while not being afraid of, when confronting the array of variable forms and modes of private appropriation of cultural and artistic production as societal relations of production. Therefore, the case of The Unbribables does require remembering to what is indispensable to the future political articulation of the social role of culture and art in the pan-capitalist system of the 21st Century slavery. The task before us is not about taking the institutions back by reclaiming their privately appropriated social functions, but to conceptually and practically devise the strategic means for the incessant tactical repositioning towards the insatiable appropriative politics of the capitalist state apparatus. This strategy and tactics can be viable only through establishing transnational independent associations of the cultural and art producers in direct opposition to state apparatus, that is, outside the system of corruption and beyond the global system of technical division of labour and labour market. Given that there are no free autonomous zones within capitalism, precisely because there is no externality to the ubiquitous system of the reproduction of the relations of economic exploitation and political oppression, artists as producers must act beyond transnational oligopolies as well as against the global cartel of the local clientelist partitocracies and the international financial institutions in order to invent the politically articulated position that is not yet regulated by the bourgeois state legislation. In other words, this should be done before the ideological hegemony of the ruling class and the ensuing corruption that is peculiar to it are being additionally consolidated by the bourgeois law. Under the current conditions, endeavoring to politically articulate the new forms of cultural and artistic practices, require constant strategic and tactical repositioning vis-à-vis the variable forms and modes of appropriation of cultural and artistic production of societal relations of production. This is to be done without the mediation of the cultural institutions and against the coercion of private appropriation and its safeguard – State. Therefore, art and artists today ought not to act either “beyond” or within the existing institutional framework of culture and arts, reclaiming its non-existent autonomy within the capitalist system, but directly against it so as to expose the real economic and political interests of the ruling class, laying behind the variable modes of ideological appropriation of the cultural sphere and arts nowadays. The struggle against the profit-oriented cultural industries and non-localized structures of exploitation of art and cultural practices as commodity, should nevertheless be devised as to transcend the national level of the global economical-political system. This system is safeguarded by the global cartel of the local clientelist partitocracies, whose particular economic and political interests are structurally intertwined with the flows of speculative capital and the political ends of the current imperialist blocks. In a situation characterized by the collapse of the entire educational system and the ever-increasing deprivation of vast majority of people of the basic material means for the simple reproduction of everyday life across the globe, art and artist ought to ignite all conceivable forms of the politics of the destruction of any form of the existing social consensus. In order to shake up status quo, they should act as a catalyst of political organizing against the existing system of economic exploitation and the new forms of slavery in the 21st Century, which no one will be spared from, including the cultural and art institutions as it is exemplary in the case of the MCAB, but also the cultural and art producers themselves who are still keen on conserving their socio-economic position. Hence, every single act symbolically denoting the refusal to participate in the cynical ideological consensus underlying the current system of the economic exploitation and political oppression, is of paramount importance nowadays, when the remains of anomic society are filled with fear and apathy and are extremely susceptible to all forms of corruption and bribery due to an ever-increasing socio-economic crisis. Therefore, we should support every single dissensual act, ranging from symbolic gestures of disobedience to the more developed forms of the organized political struggle against the economic and political interests of the ruling class. In particular, for the sake of imposing a tactical pressure upon the plurality of ideological state apparatuses in Serbia, among which the MCAB has always been a prominent part until recently when it became a part of the repressive state apparatus, our duty is to pinpoint its current functional position that is peculiar to maintaining the system of State violence, economic exploitation, political corruption and bribery, all of which was exposed by the artistic action of The Unbribables during the opening ceremony of the MCAB. Even though The Unbribables’ action might seem as a small step for artists involved, it nevertheless should be considered as an important step forward for all of us trying to keep up with The Untouchables across the pan-capitalist world, i.e., a global cartel of the organized capitalist crime consisting of the local clientelist partitocracies and global financial institutions representing the economic and political interests of the current imperialist blocks. Why the incidents at the MUSB in Serbia, cannot be internationally ignored. The Museum Of Contemporary Art in Belgrade (MSUB), Serbia, opened its doors on the October 20th 2017 after being contentiously closed for more than a decade. Supposedly to carry out a progressive delayed upgrade that had turned into an interminable renovation process. Almost a decade long excuses of construction problems, contractual difficulties and mismanagement, caused the institution to be disconnected and intentionally detached from the cultural discourse in Serbia. Historically this museum has been blemished and plagued by controversies and scandals. The opening was not an exception in this. Announced to be open for 7 days and 24 hours non-stop could even though be regarded as a populist move, but not really a bad concept. However, issues with a private security firm, who were instructed to thoroughly check intrusively visitors at the entrance resulted in offensive examinations of visitor bags and controls of each and everyone, not unlike protocols as they are used at airports. Harassments and occasionally violations, caused some really embarrassing situations. People with empty papers, sketchbooks and drawings, were targeted in particular and were told that “political connotations cannot enter the museum”. 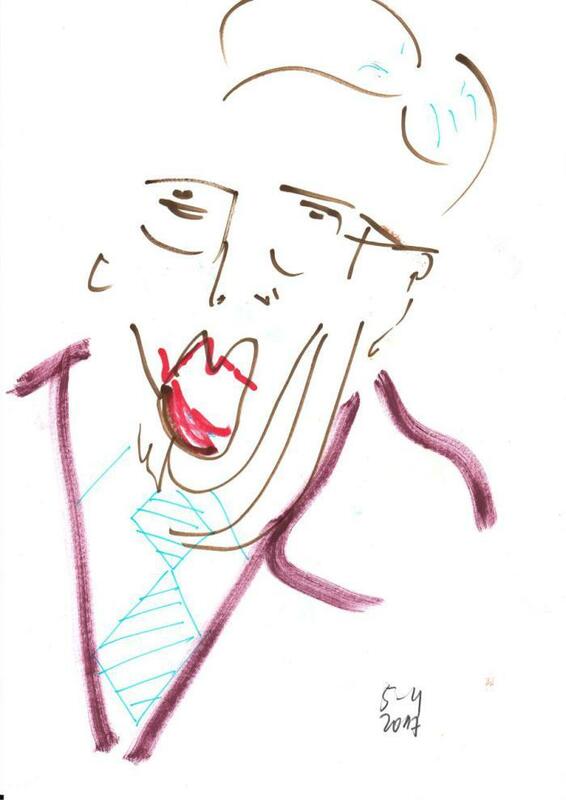 Sketches were ripped out of sketchbooks, drawings were confiscated and discarded in big trash bins at the entrance. On the first day of the opening, two independent performances had been done, which caused the detainment of Vladan Jeremic and Uros Jovanovic on questionable grounds. An official statement by the museum took more than a week to be released, and complied with the museum’s history of controversy and mismanagement. It would be naïve and ill-informed to denounce either the art performances by the Unbribables or by independent artist, Uros Jovanovic, at the opening of the MSUB (Museum of Contemporary Art Belgrade) as un-civilized. As acting substitute director of MSUB, Mr. Slobodan Nakarada clearly states: “that such kinds of art, exceeds certain limits of civilized norms”. An obvious and targeted demonization which in assumption discloses intentionally concealed structures of power and interests, leading directly to presume similarities with official media messages and how they are usually being disseminated by the current ruling government of Serbia, through their increasingly controlled media outlets. Provoking often to question the content as clearly constructed, fabricated or even imagined. Although Mr. Nakarada clearly mentioned the action of artist Uros Jovanovic in specific, as uncivilized, a solidarity between the Unbribables’ and Uros Jovanovic’s performance should be taken as equal position, as it would be intrinsically incorrect to threat these actions with different standards or norms. Both were clearly communicating a message through artistic expression. Hence marking the artists of the Unbribables and Uros Jovanovic, into uncivilized opponents is just one way of suppressing their voices and thereby clearly intentionally disregarding and evading the questions this performance is raising. Instead of accepting the performance to trigger a cultural dialogue, it has been immediately buried as an act, utterly inconspicuously, and not worth to address any thoughts to. Brandishing the event as such, might provide the false hope of diminishing the confrontational message behind the performance, but also eliminates the possibility to open up a discourse abut the content of this performance, as it was correctly highlighted by the Association Independent Cultural Scene of Serbia (NKSS) as a typical case of censorship. Transparency, as it has been claimed by the EU as an important tool against corruption seems in this case intentionally being obfuscated and can be interpreted as indexical of the practice to conceal issues which are at least inconvenient to some political actors and their hidden agendas. Who is providing the given statements really? The acting museum director, Mr. Nakarada, the curators Mr. Eric or Mr. Sretenovic. Their somehow contradictory statements indicates a larger problem, obvious personal interests, fear and official instructions how to publicly communicate this issue. Why their official statement about this issue has taken so long to be formulated? A subtle spin on the whole incident to safeguard each position in relation to the Museum, and its obvious links to a government that works overtime to construct an image in the media, locally and internationally. The statement from Mr. Nakarada, did not even attempt to address the events as they really took place. Blatant untruths were officially stated, while gradually, independent witnesses (visitors of the MSUB who experienced violations at first hand themselves of questionable policies as they were executed at the premises of the museum) are publishing their experiences, providing quite a different take on the events as they really happened. This has given extra weight when the rude entrance policies violated the Danish curator Parl Kristian Bjørn Vester, which provided a detailed report on his Facebook page of his harassment. Mr. Nakarada obviously underestimated the power of social media, and in a previous era could get easily away with these constructed statements. However in this period where media is more direct, extremely fast and transparent, issues cannot stay concealed for very long. Vladan Jeremic was detained at the entrance of the museum, which Mr. Nakarda denies, as he mentioned that the artist which was detained was outside the territory of the museum. The more information is appearing differently, than was communicated through the official statement, the more Mr. Nakarada’s position as director of the museum is in question, which conveniently will end in approximately two months from now. Thus Mr. Nakarada can easily defend a story which does not convey the reality as it happened, and can conveniently disappear in oblivion taking with him, his deceitful media spin, leaving the museum unharmed and purged of any blame. A Coincidence? As a reminder, the demonstration of 2015 at the premises of the museum was a criticism of why the museum had been closed for so long and how mismanagement has caused so many delays and disruption in its recent existence. The defenseless citizens were confronted by an armed police cordon. Was this a prelude of something which seemingly is becoming the norm today, with one simple but significant difference, that private security companies are now employed to execute similar functions as the police did before. Who owns those security firms and who controls them would provide an interesting insight in this story? Pressuring artists by firstly detaining them and secondly by obfuscating, who in person, was responsible for this ordeal, thereby subsequent evading public criticism, raises an array of urgent questions. Authorization of private security companies instructed of autonomously dealing with legal issues as they should have been executed by police only, emphasizes problematic conflict of interest and responsibilities. It is an interesting legal issue which surely might be difficult to justify by an aspirant member of the EU. Are cardboard masks, sketchbooks with sketches, and black and white copies depicting sandwiches really threatening and impacting the safety of visitors of the museum and its premises? Why did the official statement, attempted to indirectly connect the alluded confiscation of some knifes, scalpels and a screwdriver, to the artists who had nothing to do with these objects. This is clearly another form of demonization and false justification to emphasize on safety and protection from theses ostensibly dangerous artists and their purportedly noxious action. However the performances were non-violent and well perceived and appreciated by the visitors who were confronted with it and were clearly understood as a friendly artistic expression. It shows clearly that the danger was considered in the ideas which were communicated by the artists, rather than real imminent treats they could have on the wellbeing of the visitors. The threat was pure conceptual in the form of criticism about how corruption, instrumentation of an important institution of contemporary art for political propaganda purposes, formed the foundation of the opening of the MSUB and the links with the ruling elites. Even though highly suggestive and metaphorical, the performance was intended merely like an invitation for cultural and societal dialogue, using media, which intensely focused for the last years, attention on these issues. The official reactions, however somehow provided the impressions that the content of the performance was not without truth. Claiming that the performances were insulting the president of Serbia as a reason to detain first Vladan Jeremic, while he only claimed responsibility to protect participating persons of the performance and visitors of the museum, who were carrying performance props into the museum, is a very strong and hyperbolic reaction. Hereby indicating a recognition that what was innocently communicated, perhaps, showed something so revealing and thus harmed the public imago that was for so long carefully constructed. Would a tolerant attitude allowing the performance to happen without intervention, generate the same media attention is unlikely. The exaggerated reaction of the authorities thus provided the ammunition to backlash and thus place attention on their own actions as questionable and suspicious. Could we assume by this that it merely unveils the tip of the iceberg and that what has been hidden requires all efforts to be kept in secrecy? Or in reversal, what does the government, through their smoke screen of confused responsibilities really try to hide? Is this European ambition of transparency to fight corruption perhaps the reason why the actions of the Unbribables is such a thorn in the eyes of the authorities? Of course this is all speculative and can not be said aloud without to expect repercussions or ramifications. So why is this situation so important internationally? Serbia is a small insignificant country on the periphery of the EU, right? Or can we assume that what is happening here is being not only tolerated by the international partners of Serbia, but somehow instigated. “Who benefits from what?”, should be the real question. Why there is silence of this issue in most European countries, like it has been censored out of their media. Or perhaps it is really not important enough to Europe what is happening in Serbia. Both hypothetical issues are problematic. The first issue points out clearly what is the real interest of Serbia to Europe. Economically, strategically, industrial, military are just some territories to name as points of interests. The second assumption is also problematic in that it indicates that the European Union is not interested in Serbia at all, contrary as what the ruling government constantly presents in its almost fully controlled media. That can be interpreted as abuse of power and manipulation of the public opinion to its citizens to consolidate its position of power and dominance beyond a democratic structure. Which in assumption resembles more to an autocracy than it has to do with democracy. The reality probably lies somewhere in between, which unfortunate is not very encouraging either. Could a small group of artists really lay bare these enormously complex structures? Probably not, but the lack of international attention of what really is happening here, is indicative to probably corporate and thus political interests with Serbia. Simultaneously the lack of reactions from the important cultural players in the European Union might indicate that this freedom of artistic expression has been desecrated on a much wider scale. Whose interests are really protected by keeping their silence is an interesting issue. Who really owns most of the museums, institutes, biennials, festivals and so on, are the providers of money, and what they ultimately try to protect is their economic and political interests, which increasingly is in affluent private or corporate control. Self-censorship seems in the end not to be something exclusively Serbian, but might be a much wider spread problem than at first sight. This is really an issue which should dominate the discourse in contemporary art, academics, among cultural workers, at NGO’s and so on, to safeguard what is left of artistic freedom and cultural independence. If this is really destroyed, than the contemporary societies have lost their necessary unbiased mechanisms of reflection and interpretation to balance the increasingly dominant powers of neoliberalism and corporatism. What is happening in Serbia, can just be considered as symptomatic of what is happening on a bigger scale. Let this be a sign, and hopefully trigger this discourse to re-install a system to protect and criticize individuals and values which are paramount to a socially just society for all. The arrests at the Museum of Contemporary Art in Belgrade on October 20, 2017 of Vladan Jeremić and Uroš Jovanović confirm that “the art of any period tends to serve the ideological interests of the ruling class," as the late British critic John Berger put it. It appears that no amount of cultural introspection will change this unless people are willing to break with art’s complicity with both the world of investment and that of the upper classes (aristocratic or nouveau riches—it doesn’t matter). This would appear to be among the hardest point to raise from within the art world, due in large part to the massive proportion of middle and higher class people employed in the arts who have a interest in suppressing debate on the social structure of the cultural fields. To be sure some headway has been made by the recent #metoo and ‘we are not suprised’ movements, yet the anonymity of many of the accusations risks cheapening the debate as it becomes a vague mud flinging exercise. While the long lists of names, headed by celebrities appear like the beginning of show trials, aimed partially at elevating the named above everyone else. Additionally, it ought to emphasized that raising social class inequality may be uncomfortable for a lot of women who pledged their support for ‘#metoo’ and ‘We are not surpised’ as they are often complicit with class subjugation… they too are running or staffing the foundations that are not paying people, the magazines that pay little and late, the galleries that don’t pay up. Indeed we are far from an intersectional response to widespread wrongdoing in the art world. This wrongdoing serves to objectify art workers of every kind, as their dreams are dashed and their objections are silenced for fear they will lose their jobs or be hindered in their careers. We all know this is ongoing across the artworld with low pay, no pay and frequent failure to recompense artists or other workers the agreed amount being all too common as practices. This is a form of control that is a widespread as censorship and state intervention in art protests and as common as sexual harassment or assault. Given the interlocking nature of grievances against the art system—against chauvinism, class exploitation and complicity with violent or corrupt regimes—it seems that there is no way forward other than via a some kind of committee established to address wrongdoing on several fronts simultaneously. Though it appears clear that so long as this takes place within the art world it will be rife with the problems common to that field, as one that operates in the service of power. Among all the mud flinging it is time to begin the slow and diligent work of forming a network charged with assessing the human damage done year on year as the artworld dashes dreams. This is not a time for celebrity grand standing, for score settling or for tarnishing names for the sake of it. It may be a case of ‘the less names the better’. It may be a case of working in anonymity. It will definitely be a case to suspend for a moment the spectacle of show trials, accusations and counter accusations. Whoever has the time and patience to engage in this slow process of building a truly intersectional platform for the investigation of art world hypocrisy is a true comrade. Those who are seeking to capitalise via a call-out culture are part of the problem and they are doing the work of the elite for them (often as they are part of that same elite). We must stand with Vladan Jeremić and Uroš Jovanović in acknowledging that the problems in the art world run deep and are strongly linked to politics at the state level. Let’s address abuse of power as the principle enemy with the patience the issue deserves. Social media will bring a new hashtag campaign with each week that passes, blinding us to central issues if we are not sharp witted and if we do not adhere to the long game. I express solidarity with the Unbribables and their October 20th 2017 action at the The Museum of Contemporary Art (MCA) in Belgrade which 2 artists: Vladan Jeremic of ArtLeaks and the Unbribalbles and Uroš Jovanović were detained by “authorities” (in fact it seems, handed off by private security to state police in a way that echoes the privatized military of the US). As a member of Occupy Museums and Gulf Labor who has been working on direct action with art institutions (here writing individually) I understand their action as a successful one. In a symbolic and non-violent way they have nonetheless managed to provoke the soft power of a cultural institution into showing its true face, causing the institution to immediately snap into a repressive mode in which symbolic performances that mock power as so many have in the history of performance are now impossible and doodles in notebooks are dangerous and in which any museum visitor is a potential criminal who should have their papers checked. Its deeply chilling but not unfamiliar. An ahistorical yet persistent bourgeoisie opinion exists that art that doesn’t comply directly with an institution is simply a pesky fringe disruption and its best to enjoy the contents of museums in the solemn silence of appreciation. In my view however, the Unbribables action is a highest form of respect for art and its sanctioned place of public viewing. Like the outside analysts that corporations are always hiring, but for passion and structural analysis rather than fees, they have challenged MCA’s relevance to a social system in which power is shared rather than hoarded, and they have received a unfortunate response. In expressing solidarity with the Unbribables I must also mention a connected platform called Artleaks (“It’s Time to Break the Silence!”) which is co-edited by Unbribables members (Jeremic and Radle). This platform which Occupy Museums and Gulf Labor has often used as a forum and repository for key arguments and documents during our campaigns where the issues can be discussed with precision, is one of the most powerful and independent platforms of its kind to emerge since the season of 2011 which has marked a turning point both in centralization of political and economic power worldwide but also toward the genesis of transnational structures to combat it. So I fully agree with Milan Rakita’s comments above: “strategy and tactics can be viable only through establishing transnational independent associations of the cultural and art producers in direct opposition to state apparatus.” That is what we face both in the US and Serbia: a growing repressive Nationalism that is simply the other side of global coin. Isolated, we are cornered. Sharing information and even resources, we have seen victories such as the coordinated campaigns against dirty oil money funding museums which saw BP kicked out of the Tate Modern (Liberate Tate) and David Koch kicked off the board of the American Museum of Natural History (Not an Alternative). Global Ultra Luxury Faction (GULF) in its campaign against the Guggenheim Abu Dhabi coordinated a direct action in Venice in tandem with s.A.L.E Docks sending a powerful message that retreating to their multiple bank-like branches is no escape from labor justice. While the MCA has no other sites, its controlling government relies on trade and policy relationships with a number of repressive states that it uses to leverage anti-democratic positions on its citizens and it likewise needs to be challenged with a transnational network of knowledge sharing and mutual aid and ArtLeaks is already doing that. During the work of Occupy Museums over the last years it appeared that US museums which are supported nearly 100% by private philanthropy play by quite a different set of rules than those funded by cultural ministers and we reasoned that state funding must be somewhat more democratic than the opaque decision making of elite boards of trustees. Many gatherings over the years however, revealed that European comrades (for example in Poland and Hungary) dealing with repressive institutions seemed to desire more privatization as a way to enjoy the artistic freedom (perhaps projected onto New York and the US) outside of the corruption of the political process. Now its becoming clear to me with the rightward political march in the US and Europe as well as the ever growing power of the 1% that the difference is not so big. More than differences we see commonalities and the main commonality is a growing silence. Perhaps what these actions reveal more than anything else is how much self-censorship exists in the arts and is defining art in the present moment. The spiraling precarity of low and middle wage workers there and here and everywhere means that “opportunities” get equated with bare survival, and this extreme dynamic means that power goes unchallenged which allows for the rapid instrumentalization of our field into asset-production for the elites, brand washing, and real estate mega-deals lubricated by culture. In New York and LA its gotten so bad—galleries and museums as Trojan Horse for gentrification—that its impossible to see that art inside as other than a tool of neo-colonial land grabs. What we are seeing in Sebia too is at crisis level: As the NKSS wrote above: “It seems that security and control itself, became the chief curator of the most important institution of contemporary art in Serbia.” That means that art itself—the very core value of what our lives are involved with—is getting truly captured as a result of prevailing silence. What to do then? Our job is to bring art to a framework of social relevance, to keep reminding, keep pushing—not only with words but also actions, artworks, deeds—deeds in which, crucially, risk is involved as we see with the Unbribables action—that the avante garde is not just an entertaining play of form and content but an expression of the awake and fearless struggle of people against the accumulation of power over everyday life. Onward! Dear Unbribables, Vladan and Uroš and others, thank you for existing and resisting! Here we are guys, in front of the neoliberal turn of the screw! It is not fascism with its total censorship of the “left side” of the art+world; it is not the dictatorship of state socialism that disciplines art through the unique form of socialist realism; it is just the apotheosis and immanence of the Deleuzian societies of control with its new forms of institutions and institutionalization, where the private police controls the entrances and in the same time guides the visitors to enjoy the work of the BEST ARTIST, the work of your CURATOR IN CHIEF. Dears, I want to remind you Danis Tanovic and its “No Men’s Land”, where a character states: “A pessimist says things are as bad as they can be and the optimist says they can always be worse”. So, don’t worry, nothing new from the underdeveloped Balkan area … just take a look in Albanian context where the Prime Minister opens, inventing it as a magician, without any legal status, but with public funds an art space called Center for Openness and Dialogue (Sounds like a joke, don’t you think? It’s just expropriation of the meaning of the words. The acronym is COD … codification? ), inviting glamorous artists from western countries (Parreno, Demand, Holler). In the same time, in 2015, the National Gallery of Art had an annual budget equal as the costs of the installation of Parreno’s Marquee, 25.000 USD. As you can imagine even here, in Albania, where the political power has expropriated not only the art space, but even the words, there is some resistance. Here are some public interventions of Tirana Art Lab and Georgia Kotretsos. However, pay attention! The awareness it is referred maybe not to Vladan and Uroš that are aware enough, especially after the arrest, but to the others. The title of the performance of Uroš “Vučić – the Best Artist” it is not a metaphor; nor a prevision; it’s already actuality. 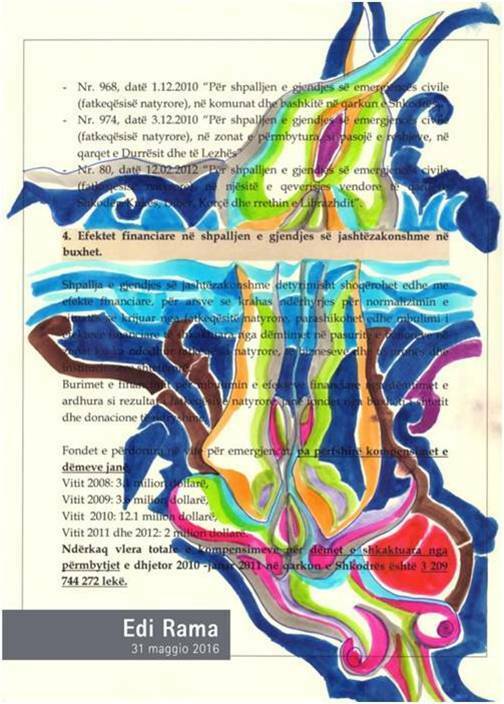 Quoting the comment of nfischer the “dangerous doodles in notebooks” of the Albanian Prime Minister Edi Rama are showcased in Venice Art Biennial. And his doodles are not only artworks. His artworks are laws also. Here it is the law approved by Albanian Parliament which regards the natural emergencies (ironic, don’t you think? ), showcased as part of the wallpaper of Edi Rama in Venice Art Biennial of this year. As you can imagine it is not the case of Benjiaminian “aesthetization of politics”, as there is no space left to the resistance of art against the politic power: the art and political act, the Artist and the Politician are immanent, are the same person. In this kind of situation the creative act of resistance cannot exist. The artist is superfluous. So it is the Sophocles’ Antigone’s act that resists the law. So it is the art. In other words, the perfect imaginary world of neoliberalism. But, as I said don’t worry. There is much more possibilities of resistance. I don’t want to call them strategies, as there is a lot of “ego” in strategy’s etymology. Anonymity sounds better, as suggested by Mike Watson. Or, as I prefer, fragmented subjectivities, that redound as spatial and temporal polyphonies of peoples with the same passions and inspirations. So, for me you have done a lot. Svaka cast! We frighten them, but we also confuse them. The uniformed flunky’s of our failing states have only one response to the ontologically destabilizing action-object that the Unbribables presented in Serbian public space on October 20th, 2017: get out there and do what police are supposed to do for chrissake, detain someone, question someone, even better, apprehend several someones and get to the bottom of it all (even if there is no “bottom” of it of course). Still, what is crystal clear regarding the absurd arrest of Vladan Jeremić and Uroš Jovanović on that fine Fall day is that their actions in front of the Museum of Contemporary Art in Belgrade presented a synecdoche of something far larger and more disturbing to authorities than simply a few people wearing paper masks and distributing flyers with images of what we in NYC consequentially call a subway or torpedo sandwich (or what they call in Philadelphia a “Hoagie”, back to that in a moment). The Unbribables oppositional measures were intended as a seriously playful protest against the reign of extreme nationalist Serbian President Aleksandar Vučić. But they were also targeting the repressive cultural environment that his regime, and others like it in Europe, Asia, and North and South American, is now fast-breeding as economic, environmental and political collapse converges across the globe. This is what political scientist Rebecca Bryan describes as the Uncanny Present a time in which there seems to be only a sense of now, but not a future [Rebecca Bryant, “On Critical Times: Return, Repetition, and the Uncanny Present,” History and Anthropology, No. 27, 2016. P 27"]. And as we confront the desperate desire to resurrect national identities and the imagined ideal of embodying an ethnically undiluted, all-inclusive specificity, the slightest hint of alterity –whether mimed, masked or militant– is certain to be seen as a part for a whole: a bit of opposition that stands for a potentially rebellious and sweeping rejection of capitalism’s eternal return of the same. In meanwhile a more detailed account of the events following the arrest (including the artists’ statements about the motivation and concept of the action) has been published (http://artseverywhere.ca/2017/11/08/unbribables/). After reading the report and after listening to the press conference held by the Director and the curators of the Museum of Contemporary Arts it became even clearer how profound was the involvement of the Museum in this “theatre of cruelty” and the obvious disproportionate use of force. There were so many other more appropriate ways how to deal with this artistic action (if any were necessary at all) so the actual course of events reveal that the institutional policies function as a hologram of the state’s abuse of hegemonic power: rather than following the Foucault’s calling for refraining from “governing too much”, from the abuse of the power given, obviously the Museum had chosen to fully immerse in the systemic structures and to uncritically identify with their fashion of “over-governing”. What a mess. Yet this needs a qualified internationalist solidarity. The recent return of ethno-nationalists to power in Eastern Europe, which accompanies the protectionist/racist/defend-our-privileges return in West European states – the New Right or the New Conservatives - is in the best-case scenario a rather late defense of the state apparatusses at the end of a transition that ransacked the centralised wealth of the former socialist states. State nationalism claims apparatus sovereignty, which is something very different from popular sovereignty: this comes on the background of the social catastrophe of the postcommunist transition, at the end of which the only “winning” local sectors – besides the pure capitalists - have been the secret services, the military, the police and other such institutions. In the worse-case scenario the New Right turn in Eastern Europe is simply a fight for power and resources between the super-rich in a situation of quickly achieved monopolies. And the two scenarios are not excluding one another. So the ham-handed profiling and arrest of the Unbribables is a reflection of the concentration of the reactionary forces of the transition at its end. The background is what is new and that’s why repression against cultural workers is more likely in Eastern Europe – because the current wave of politization is animated by the dangerous feeling of disenchantment with the whole package sold to the former socialist bloc after 1989 – which includes the “European dream” bound to the capitalist dream. The Unbribables clearly touched a nerve, so they’re doing something right. But on “their” side criticality and resistance is turning into action and organization throughout the former socialist bloc. As our Chinese comrades used to say, East European leftists move from the experience of both theory and practice – and we had plenty of both in the past two decades too. So, I would plead, firstly, for a qualified internationalist solidarity for the Unbribables: firstly, against monocular solidarity expressions – a lazy-eye affliction known to beset especially our comrades from the West. 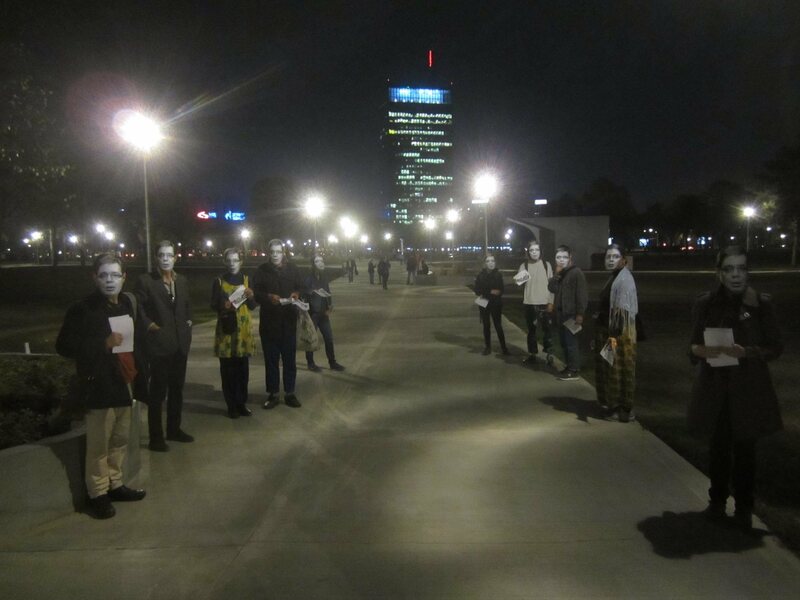 The action of the Unbribables raises the issue of international solidarity with the processes of the region, including the meaning of a cultural worker as seen from the sidewalk facing the Museum of Contemporary Art in Belgrade. What happened in Belgrade is part of a regional problem, and should be discussed in Sarajevo, Zagreb, Warsaw, Budapest, Bucharest, then Vienna, Berlin… Yet this is also part of the emergence of an authentic critical tradition in Eastern Europe developed from the experience of the past decades - and in positive relation to the socialist past too. Secondly, against one-handed solidarity expressions: we are currently witnessing attacks against many of the places and environments of criticality, where the current wave of popular politization could find resources – and these now include in some cases even the third sector, the formal civil society. The international scenes of contemporary arts have been in the 1990s-2000s rare places welcoming critical thought - not only in the shape of living masters, but also in its incipient life forms – but independent places have multiplied and have accumulated in the meantime their own significant history. As the Unbribables justly pointed, the reopening of the Museum of Contemporary Art in Belgrade should not happen outside this history or outside radical critical takes on the ongoing political context. Instead of arresting and separating, what is needed now is to link such art institutions to processes of communization outside the galleries, museums and biennials, and to connect the solidarity energies for the freedom of oppressed artists with other energies of emancipation, embracing what they are doing as a positive contribution, as cultural workers, to changing the local and international conditions of our common problems (Ovidiu Tichindeleanu). So, I would plead, firstly, for a qualified internationalist solidarity for the Unbribables: firstly, against monocular solidarity expressions – a lazy-eye affliction known to beset especially our comrades from the West. that’s very well said by the way! I am glad to see that the discussion on this issue took this line, namely: a) It is very important nowadays to emphasize the responsability of cultural institutions at making silence. Silence is political. b) In a world obsessed with communication and networking, it is quite ironical to notice how difficult is organizing and resonance-making information like this. In this sense, the work of ArtLeaks, the role of a magazine like Political Critique which published an interview (http://politicalcritique.org/cee/2017/no-more-clones/) on this case and this discussion are extroardinary relevant. In this moment, I can not stop thinking about Mail Artists networks in the 70s, and how important they were to produce international acknowledge of repression and violence on artists in South America. We are very aware of the importance of this role, and we must be aware of its traditions and histories. c) I would like to say that from Ljubljana and from Montevideo and Buenos Aires some of us were following this case and thinking about its implications. The political and institutional framework of this case, even if it has its own peculiariaties in Serbia, the Balkans and in ex-Yugoslavian countries, can not be reduced to national specificities, as Tony Maslic have ponted out: just think about Brazil today, for instance (see: https://ladiaria.com.uy/articulo/2017/10/guerra-mediatica-contra-el-arte-en-brasil/). It is time to recognize the extremely dangerous developments of the current state of things in an international (which is not the same as global) level, and the political and organizative imperative implied on doing so. In this context, I guess that it is also important to take this considerations as points of departure for starting thinking not only in the terms of what sometimes look like “political-applied art”, but also in aesthetical terms, in historical terms, in performative terms. And then is when the question of self-censorship and the notion of censorship itself, so much misused and at the same times forgotten in its actuality (in capitalist and parliamentary-democratic systems as well as in some “art worlds” of our cultures), becomes specially relevant. Thanks, The Unbribables and all who are building this discussion.